This lavish piece by Cartier was worn by the Duchess of Cambridge during her visit to an Olympics exhibition at the National Portrait Gallery in July 2012. 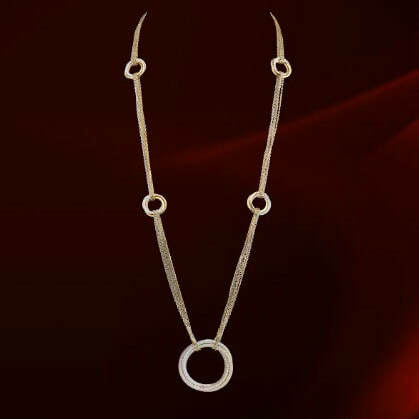 The necklace is from Cartier's Trinity collection and is described as “the pure simplicity of three magically intertwined circles of pink, yellow and white gold.” The circles are set with diamonds on a long gold chain. 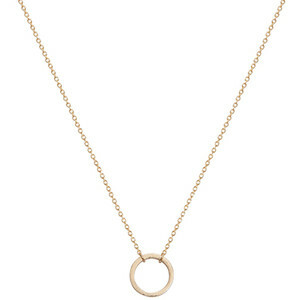 STYLE FILE: Cartier Trinity necklace seen on Kate Middleton, The Duchess of Cambridge.